> Château De La Chaize. Products of the domain : Château De La Chaize. Château de la Chaize is one of the largest estates in the Beaujolais region and the largest in the Brouilly appellation, representing nearly 10% of the Beaujolais' total production. We will recall that the Beaujolais counts ten different Crus, but the Brouilly is recognized to be the finest and the most elegant. Château de La Chaize is located in Odenas, on the Beaujolais Mountains, and has 99 hectares of vines in one piece, which is exceptional for the region. The Marquise de Roussy de Sales, a descendant of the Marquise de Montaigu, has made the estate evolve in the 1970s to adapt it to modern viticulture, and to export these wines, especially in the United States. Today the vines are conducted with care and passion, in reasoned agriculture and hand-picked grapes, in the most traditional way. The Château de la Chaize proves, vintage after vintage, its attachment to perfection and tradition. The breeding is done in lightning of 40 to 100 hl, in a remarkable cellar of more than 100 meters long and dating from the XVIIIème century. 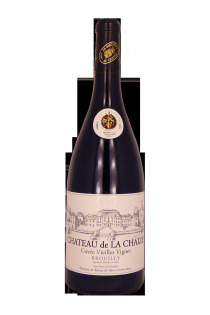 Brouilly Cuvée Vieille Vigne - 2014 - Château De La Chaize.